"We are an established general and architectural aluminium fabrication company specialising in aluminium railings, gates, fences and balustrades together with providing skills in the layout, fabrication, assembly and installation. It is only through technical knowledge, our people, experience and designers that we are able to create value for our clients." Residential, commercial, retail or industrial, small project or large, we can deliver exactly what you require from security fences to safety standard approved pool fences. 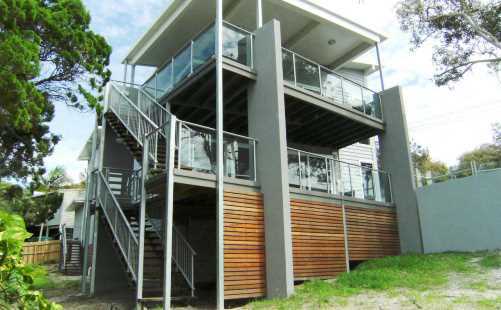 Glass panel or plain aluminium balustrading is now in high demand for residential homes both interior & exterior replacing the short lifespan timber products. Ever versatile, long lasting, sturdy auto or manual gates that will not 'droop’ with age offering your residence or commercial property any level of security and appearance as required. Whether you are wanting to screen off your relaxing zone or hide those wheely bins, we have a privacy screen design that will suit your requirements. Light, economical and long lasting.